White-breasted nuthatch have the unique ability to go head-first down a tree. Learn more! 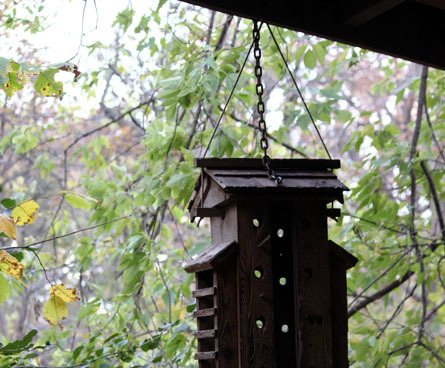 Bird lovers are always asking "How can I keep squirrels off of my bird feeder?" When you create a bird-friendly yard you are likely to also attract other (more furry) visitors like squirrels, so plan for that from the beginning. Squirrels can chase off your beloved birds and make a mess of your bird feeder and yard, so we've gathered some tips to help you keep your bird feeders intact and squirrel-free. If you want to keep squirrels off of your bird feeder, you can start by making it difficult for them to get to the food. There are a few tried and true tricks for discouraging squirrels, and hanging your bird feeder somewhere they have difficulty reaching is something bird watchers everywhere recommend. Location, location, location is key. Squirrels are great acrobats and can jump eight to ten feet, so put your feeder as high off the ground as possible (without placing it next to a tree where spry squirrels can climb or jump over to it). This feeder hanging a foot from the house is a squirrel's paradise! Some bird feeders are so easy to feed at that no squirrel can possibly pass up this free meal. A huge platform... hung low near the ground... This wooden bird feeder looks like an open dinner invitation to a hungry squirrel. Choose a feeder and location that don't encourage squirrels to come back! 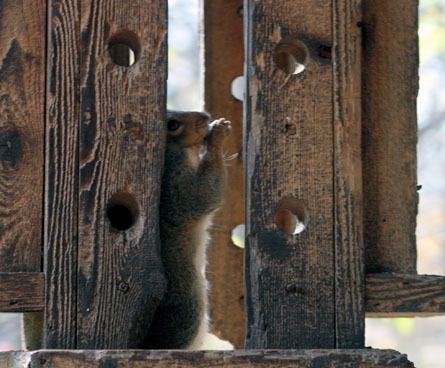 How do you keep squirrels from climbing to get into your bird feeder? There are wild and creative do-it-yourself solutions as well as store-bought options. Both focus on creating obstacles that keep squirrels from reaching the food. Trim or cut down branches that are close to your feeder and provide squirrels with easy access to the bird food. Hang a slinky on the pole so the squirrel can't get a grip while climbing. Birds don't mind it (in fact sometimes they even use it as a perch). It's an inelegant but effective way to keep squirrels off your feeder pole. Add a tube, cone or other unstable obstacles to the pole or rope so when the squirrel comes across, it will move around and make the squirrel unable to hold on and continue climbing. Most squirrels will quit trying after a few attempts, leaving your birds in peace. You can also buy squirrel baffles, which are manufactured half circles that hang above and / or below bird feeders to discourage squirrels from climbing to reach the bird feeder. These should be 12-18" across so the squirrels can't get around them. Most swivel or move when a squirrel tries to climb over the baffle, often sending the squirrel flying back down to the ground. Squirrel-proof feeders are rarely 100% squirrel-proof, but many are engineered in such a way that it is very difficult for squirrels to reach the bird food. 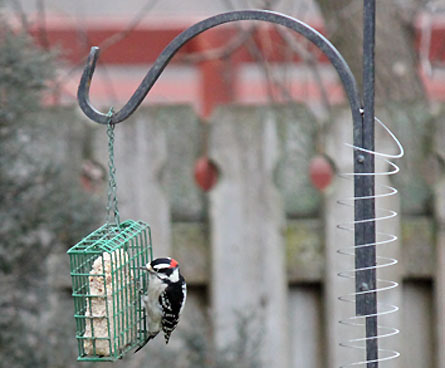 Popular bird feeders like the one below have a weight-sensitive design that closes up the feeding holes when something heavier than a bird is on it. Typically the feeding ports will close when the squirrel jumps on, eliminating its chance at a free meal. After a few attempts, many squirrels just move on to another feeder. 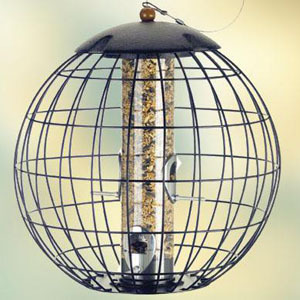 Another successful way to keep squirrels off of your bird feeders is to buy a feeder covered in wire with openings too small for squirrels to fit through. Your song birds will have no trouble reaching the food but squirrels (and larger birds like pigeons) will be frustrated by the bird feeder and hopefully move on to an easier target. Squirrels can be very destructive creatures. 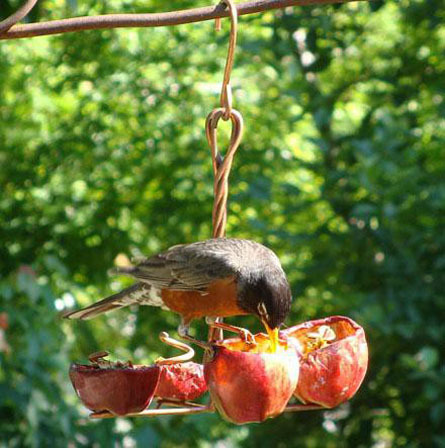 They can tear up plastic or wooden bird feeders in an attempt to get to the bird food. Their damage may be very visible (in the case of a hole chewed in the bottom of a feeder which caused all of the bird seed to run out), or less easy to notice. In some cases, the squirrels can chew or claw the feeder, creating small, sharp edges that can injure birds and people alike. Invest in a durable metal bird feeder or find a way to make your feeders unappealing to squirrels. To keep squirrels from eating at your bird feeders, you can also make changes that will make the food less attractive. Cayenne pepper is also very effective at deterring squirrels. Add a little cayenne pepper to your bird seed each time you refill your bird feeder and see if you notice a difference in your squirrel activity. Squirrels are sensitive to the taste, in fact they just do not like the taste of cayenne pepper on their food, while birds appear unaffected by the seasoning. People, on the other hand, should use caution when working with the pepper and use gloves to avoid direct exposure. You can also buy bird food with pepper already included. 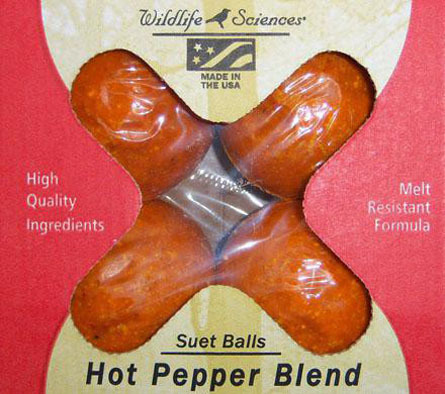 That is an easier way to make sure you have enough hot pepper to discourage hungry squirrels, without getting covered in pepper yourself. 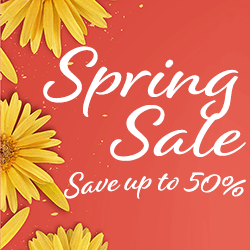 Whether you are looking for seeds or suet, there is pre-mixed bird food that will help your birds enjoy squirrel-free dining! Squirrels love sunflower seeds but are much less interested in safflower seeds. By changing your bird seed to safflower instead of sunflower seeds, you'll make the food less appealing to squirrels. We've also found that nyjer, which is a favorite of goldfinches, is not a favorite of squirrels so may be another good choice for your bird feeder. The last option is to just give squirrels what they want… a place to eat. If you create a squirrel haven away from your bird feeder, you may be able to draw them off of your feeder. Your birds can enjoy their food while the squirrels feast at their own table. Squirrels like nuts, fruits and seeds, so an inexpensive treat like peanuts might keep them happy. A fun side effect is that some birds (like cardinals, jays, juncos and woodpeckers) also like peanuts so you might attract some extra birds too! If you want to keep squirrels away from your bird feeders, try saving a few scraps from your meals for them. Squirrels, like birds, will eat many fruits including apples, oranges and apricots. They also like mushrooms, walnuts, and a favorite is dried corn-on-the-cob. When you eat these foods, save the scraps for the squirrels. It's hard to know if they will appreciate the diverse menu, but we like to think of it as a kind of recycling. Squirrels can be a lot of fun to watch run around your yard and up on your trees and fences; however, you may enjoy them a bit less when they are chomping through your birdseed at an astonishing rate. Squirrels can easily empty an entire birdfeeder in a day, spreading food everywhere and chasing off the birds you've worked hard to attract. 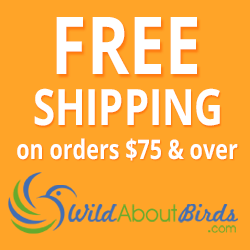 Create an environment that keeps squirrels away from your bird feeders and the birds will appreciate it!